Here are my first completed pysanky eggs. I’m pleased with the process if not with the final products. They certainly don’t look like the examples on the Wikipedia page, but they’re mine and I’m glad to have learned how to make them. I’ll show you my friends’ finished eggs at the end of this post. – My creative process involves a bit of research and contemplation before I get around to action. I’ve guessed this in the past, but now I know for sure. When faced with a blank egg and not much of an idea of how the process works I’m kind of stunned into inaction. – I have some fun and talented friends. – I don’t have much artistic ability, but I have fun trying. If you would like to make your own pysanky you can order the supplies from the Ukranian Gift Shop online. Laurie tells me she threw the purple one away because she didn’t like it. The other one is happily sitting on her kitchen table. I wish it was in better focus. She took a break to make soup in the middle of decorating that egg and it’s still the most beautiful of all of them. Many thanks to Andrea for teaching us! I have a small jewelry project on my list for next week, but you never know what might come up between now and then. See you Monday! The pysanky process isn’t too complicated. You scoop up a bit of wax into the kistka, melt it over the candle, and use the tool to draw wax lines on your egg. The wax preserves the color beneath it. You then dip it into the dye, draw more wax lines, and dip it again into another color. Above you can see my plain white egg with the first wax lines (top left), then the yellow egg with my original wax lines protecting the shiny white (top right). You can also see what the egg looks like as I drew more lines and dipped the egg into more dyes (bottom left and right). Drawing straight lines was complicated. Getting the tool to draw consistently and not make huge drips all over was also a challenge. This is the sort of craft that gets better with a clearer understanding of design and more practice. Still, I enjoyed my first attempts. It was a fun process to learn and I hope I get to try again sometime. The final step, after all of the designing, drawing, and dyeing is done, is to melt and wipe off all of the wax (hopefully without burning your fingers). Some people then varnish their eggs, but we didn’t. In this photo you can see Laurie melting and wiping the wax from her completed egg with another egg in the background. Check back tomorrow for photos of completed eggs and lessons learned. I’m fortunate to know someone who learned pysanky from her family at a young age and was kind enough to invite me to her house to learn. She had all of the supplies we needed. Above you can see her collection of dyes. These are heartier dyes than you’ll find in your average egg dying kit. Eggs colored with these can no longer be eaten as the dye is quite toxic. Of course you also need eggs. The eggs above are soaking in a water and baking soda solution. My friend wasn’t sure why the eggs needed to be soaked first, but this is what she was taught so we did it. These are whole eggs that haven’t been hard boiled or blown out. One could blow out the egg after decorating (before decorating may make it too fragile), but we didn’t. The remaining tools are a kistka, a candle, and beeswax. The kistka is a small tool that you use to apply melted wax to the egg. It works like a tiny funnel on a stick. Tomorrow we’ll talk about designing your pysanky egg. Then I’ll show you the process and our finished products. 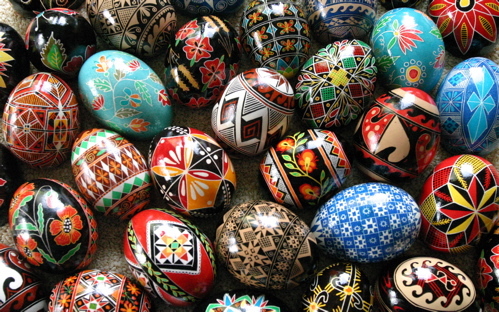 This week I am going to learn to make the very colorful and intricately decorated Easter eggs known as Pysanky. Soon you will marvel at my total lack of artistic ability! You are currently browsing the archives for the Pysanky category.